Once upon a time there was an adorable cookbook dedicated solely to making cupcakes. Enter an excited and ambitious young man ready to make something new and bake! Adorable kid in swim goggles chose KEY LIME CUPCAKES!!! 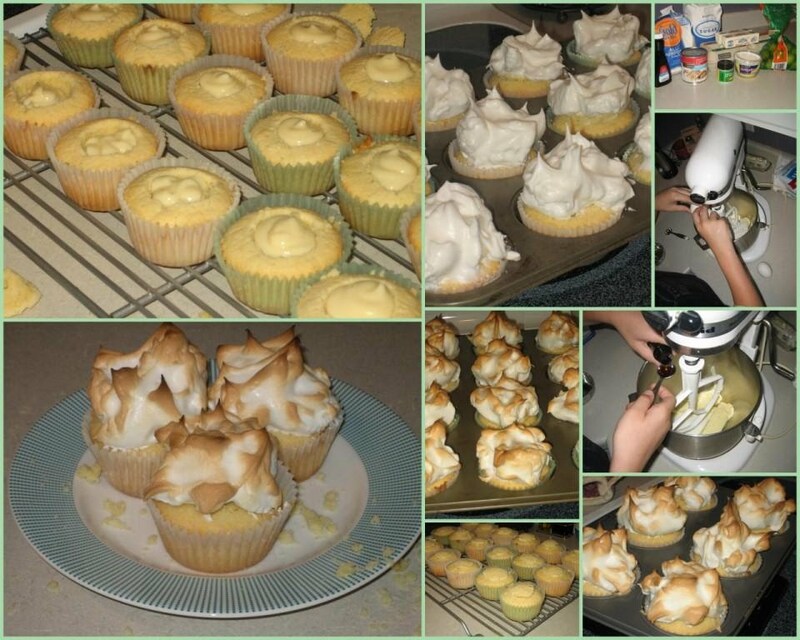 There were three sets of ingredients for the three separate components to the final dessert...the simple vanilla cupcakes, the key lime filling, and the meringue to top. A fun morning of baking involved much laughter and some learning. D-man learned how to meringue and I learned that any left over crumb of a cupcake removed to add the filling will quickly be gobbled up by a smiling 11 year old. Preheat the oven to 350 degrees and line your muffin pans with paper cups. This will make approximately 18 cupcakes. Combine all cupcake ingredients in a bowl and mix together until fully incorporated. If using a hand held mixer or stand mixer, this will take about 2 -3 minutes. If by hand, it will take longer. Pour batter into cups evenly and bake for 20 minutes. Remove from oven. Let pans cool for 5 minutes. Then remove cupcakes from pans and cool on racks. Make the filling by combining the lime juice and condensed milk. Cut out a small hole in the middle of each cupcake, saving some of the top to cover the filling. Pipe the filling into each cupcake and cover with piece of cupcake. I used a plastic bag, spooned the filling in there, cut a very tiny bit of the corner of the bag off and used that as my piping bag. Preferably in a stand mixer, beat the eggs and cream of tartar until soft peaks form. Add one third of the sugar at a time, blending until fully combined, adding the next third and repeat until all sugar in incorporated. Either pipe or spoon meringue on top of each cupcake. Bake for 5 minutes or until golden. Store for no more than 1 day in an airtight container.